An outdoor pool is also possible under the €15 million development. 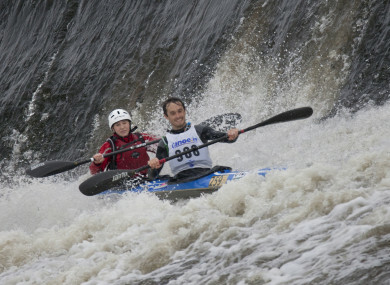 Whitewater kayaking could soon be possible in the city centre. PLANS ARE IN place to build a new €15 million whitewater kayaking course in Dublin’s financial centre, and potentially an outdoor pool or lido. Dublin City Council has invited tenders for the course as part of the development of George’s Dock, near the International Financial Services Centre (IFSC). The project, named the Water Animation Strategy, will create a 250-metre-long whitewater course and flood-rescue training centre for emergency services next to the Custom House Quay (CHQ) building. A statement on the council’s website states that the pool will be “used for canoe polo, flat water kayak training and other related activities”. The council hopes that the regeneration of the area will benefit the local economy. The Water Animation Strategy seeks to build on the successes of previous plans further promoting the area as a world-class destination for living, doing business, tourism, leisure, wellness and cultural activities. The design team for the project is expected to be in place by the summer. The dock is currently used for events such as Oktoberfest and Christmas market. Email “A whitewater kayaking course is planned for Dublin's financial centre”. Feedback on “A whitewater kayaking course is planned for Dublin's financial centre”.